LIHUE — The Kauai Composite Squadron of the Civil Air Patrol is experiencing a drop in numbers and volunteers who left are saying its ability to carry out emergency services and tsunami watch missions is in peril. The Kauai CAP received squadron of the year recognition in 2013, along with top mission pilot and aerospace education officer. Since then, the number of volunteers has fallen to 40 from 120, and the number of mission-ready pilots has fallen to three from 18, according to members who have moved to inactive or patron status or have left outright. “I don’t know what is really going on, but all of the islands are having issues,” said Nelson Garcia, a volunteer who went on inactive status. 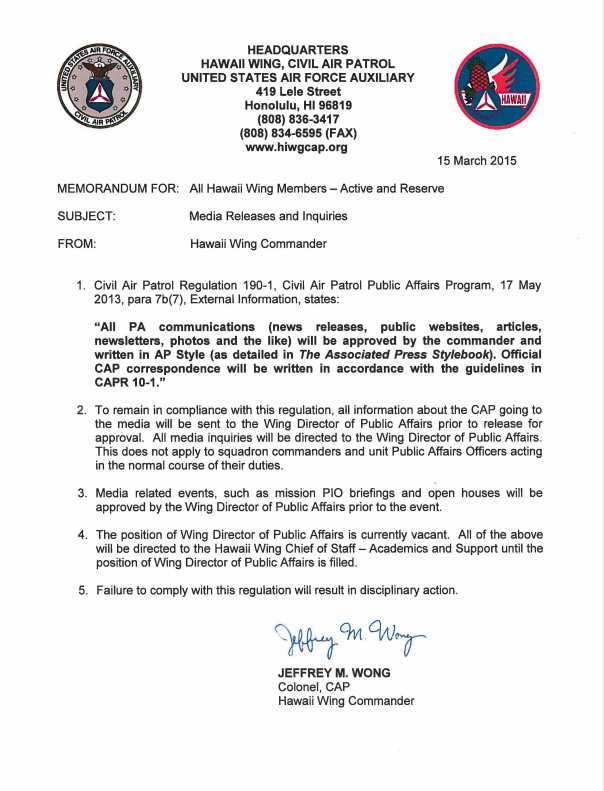 Kauai CAP Commander 1st Lt Charmine Reyes said Monday she could not comment without approval from the state wing. Dr. Michael Bailey, a Lihue dentist and CAP pilot, joined four years ago but placed himself on inactive status recently until the situation resolves itself. The environment has changed from problem solving to people blaming, he said, with issues pertaining to strong personalities and not operations. Vice Commander Lt Col Carswell Ross of the Hawaii Wing said lessons from 9/11 showed that agencies working independently on the same situation were not communicating. Today, CAP must perform within a larger perspective as a military auxiliary in support of Civil Defense, Homeland Security and the U.S. Air Force. Kauai members said the trouble began when the state wing started relieving commanders who objected to changes. Lt Reyes replaced Ron Meretillo, who resigned in December after one year. Meretillo was appointed by Wong, who had relieved previous Kauai commander Lt Col Ron Victorino in November 2013. Victorino has 52 years of service, including as Kauai squadron commander and was once the state vice commander under Col Roger Caires, who was replaced by Wong after 54 years of service. Victorino remains in patron status as an active member. Although he would not speak to the controversy, he said he would serve again to keep the unit from falling apart. Pilots, observers and scanners fly support for emergency services. Members have corresponded with the regional and national CAP command requesting that Caires and Victorino be reinstated. Ross said the volunteers need to see the CAP like the Red Cross, or police and fire units. They all operate under the same rules, he said. County Director of Communications Beth Tokioka said the Civil Air Patrol is an important component of emergency preparedness, response and public notification effort on Kauai. Three of the 10 CAP planes in the state are based at Lihue Airport. Just a year ago, volunteers say there were 18 pilots to fly the Kauai missions, along with support for the Maui and other squadrons that were short pilots. “Kauai has a significant number of pilots that were able to provide coverage for other locations,” Ross said. Volunteers say there are fewer than three CAP pilots on Kauai today. The rest have left, or are not certified for criteria and regulations that pertain to the positions they hold including flying over water and water survival. Another issue is the state wing intends to move planes around between the squadrons depending on flight hours, maintenance schedules and pilot training. This upset the commanders most, say volunteers.